Let’s talk about making a good impression now. The cold, icy truth is that you have an extremely, extremely, extremely short window of time to make it. Princeton psychologists have known since 2006 that it takes only 1/10th of a second to form an initial impression and that once it is set is extremely hard to undo. This is why taking the time to pick your brand name and strategically plan out your brand identity, positioning, and messaging is so important and valuable. You literally have the chance to pick what kind of foundation to build your business on. You can choose a strong house of bricks or a flimsy house made of straw that is going to be easily blown down. These reasons contribute to why 70% of global consumers trust a branded company vs. a non-branded company and why branded products and services are able to sell for 280% more than their non-branded counterparts. It is clearly worth a company’s time to select a proper brand name since it connects so strongly with making a good first impression. We’ll discover now the magic ingredients that go into making a good brand name. One that has the power to leave consumers with that sought-after positive first impression and the psychological magnetism that will make it stick in their minds. When it comes to picking a brand name, it’s helpful to first understand the different categories of brand names. Some are clearly better than others, but each type of brand name category has its own strengths and weaknesses. There are seven common brand name types according to Brian Lischer, another respected branding expert in the industry. Other branding experts sometimes break the categories down further along extremely technical linguistic factors, but they still end up falling into these seven broader categories and using these higher level concepts make the whole subject matter easier to understand. A descriptive brand name is the most straightforward approach to branding. It describes the product or service in its name. Think of companies like U.S. Bank, eFax, and Dish Network. While these names are easy to understand, they are hard or impossible to trademark since common words have no special protection. A descriptive brand name also potentially locks a company in a specific sector despite growth into new areas over time. Companies are often drawn to select these names at first glance because the name clearly communicates what they do and can make marketing easier in the short term. From a long-term perspective, they get harder to defend as more competition enters a market and dilute the power of the name. These brand names are a complete 180° turn from descriptive ones. They are creative, bold, and powerful when executed properly. Often a feeling of an inner power emanates from these brand names. Some of the world’s most highly valued brands use this brand name type. Think of companies like Apple, Amazon, and Nike. Despite their strength, expressive brand names come with some prerequisites to make them successful. These types of names don’t immediately describe what their company offers so extra skill is needed in communicating their brand story. The tradeoff is that the connection these brands make with consumers is even more memorable and more defensible from the competition. Being more defensible also means an easier time securing trademarks. An invented brand name can take on a similar power as an expressive brand name. Google is often cited as an example here. The name itself never existed until Google’s founders accidentally misspelled another word during their trademark and domain name search. As Google’s profound technology swept the world stage, their invented name became associated with searching the Internet and the rest is history. Not every company that invents a name is as lucky as Google though. 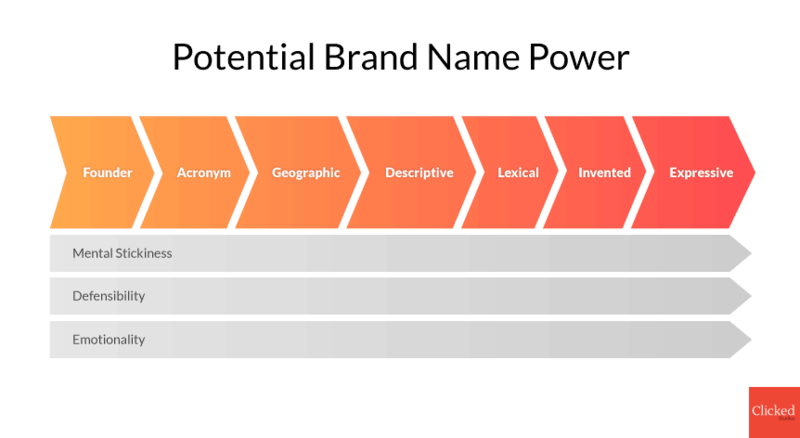 Typically, invented names come with the requirement of strong storytelling and marketing to make sure customer’s associate the proper meaning and brand story with the brand name. Since an invented name is completely unique, they are also more likely to have an easier trademarking process. Lexical brand names are like catnip for companies. They often use linguistic devices like puns, rhymes, alliteration, onomatopoeia, misspellings, and foreign words that make the brand name extremely easy to remember. Like most things though, this type of brand name has been abused to death over the past several decades. Much like the sleazy door to door salesman, these brand names tend to be in your face. Think of brand names like Western Sizzlin’ Steak House, JiffyLube, and Super Suds Car Wash. All of this exposure has made people very resistant to connecting with these types of brands right off the bat. They can be made to work, but your brand strategist has to be extremely skilled and artful with its execution to avoid turning off your audience. If you pull off a lexical brand name well you do have the added benefit of easier trademarking since the name skews towards being unique. A common, old-school brand name style. Well-known brands come to mind like IBM, K-Mart, UPS, H&R Block, CVS, DSW, and HSBC. While these big companies have made them work, a new company has many better options to choose from in comparison. Acronym or abbreviation style brand names are insanely hard to remember, require time and effort to build connections with consumers, and they are extremely hard to trademark. With all the other options we’ve discussed, this type of naming style is better left on the table. A no-brainer, for sure! The geographical brand name is much like the descriptive brand name in that they are over-used and by virtue hard to remember since they can’t command attention in the first place. Many small companies over the years have started with names like St. Louis Bread Co. (now Panera), New York Pilates, Canada’s Best Value Inn, and The Miami Distilling Company. These types of brand names tend to run into problems as their company’s early success causes growth into new regions with people that don’t connect as easily with the heritage and culture of their geographical roots. They are also harder to trademark since there is a high likelihood that someone else has already used the same brand name or something very similar for their company. Using a founder’s name as a brand name is a practice as old as time. Emery Farms, established in 1655, is the oldest running family-owned farm in the United States that uses this naming convention. In the attention plentiful years of past, using your family name was a potentially good and easy way to brand your company. In modern times though, the trend has been overused and often times there’s nothing special about the name that will make it stand out. Think of the tired cliché of law firm offices like Smith & Smith, Brown & Arnold, and Thompson & Associates. Sometimes industries have a “feel” you think you need to replicate, but picking a name like this only makes you fade into the background with everyone else. Having a different sounding name from what the industry expects can have a huge impact on making your company stand out. Ask the following questions to make sure the brand name you’re considering is strong from a psychological perspective. Does the name have a distinct sound compared to the competition? Is the name easy to confuse with a company, product, or service in another industry? Do people easily understand the name? Does your brand name inspire a strong, positive emotion in your target audience? If yes, can people outside of your main target audience also relate to this emotion? Does your brand name consist of words that are easy to visualize? Is your brand name tied too closely to a current trend that might limit long-term growth? Are there any negative alternate meanings or innuendo that your brand name could accidentally be associated with? If you’re planning to grow nationally or globally, does your brand name mesh with new cultures outside of your starting geographic area? Even if you get all of the psychological factors nailed down, there are real-world world factors you must also consider when selecting your brand name. Ask the following questions to make sure you’re on firm ground. Does no one else have a trademark using the same or similar words? Have you checked your country’s regulatory laws about naming products or services in your specific industry? Is your brand name easy to pronounce and spell? Is your brand name easy to understand over the phone? Can you make your brand name shorter so it is easier to remember? Is a .com or similar high-level domain name available? Is there strong competition on Google for your brand name as a search term? Is anyone using the term to a great extent on social media profiles? 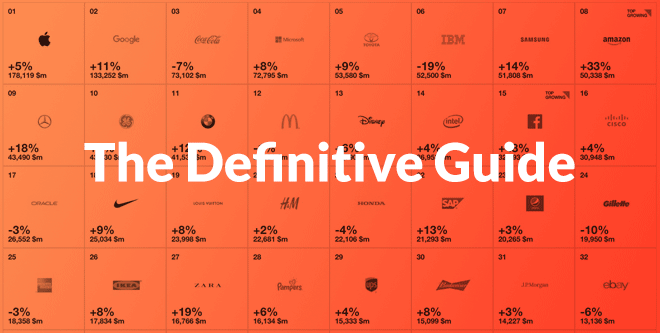 What Kinds of Brand Names Make up the Top 10 Brands in the World? 7 out of 10 of these global brands are either expressive or invented brand names. The critical detail all of these brands have in common, besides billions in market capitalization, is the strong emotional connection they’ve built with their target audiences. Only 2 out of 10 brands in this list have a founder name and only 1 out of 10 uses an acronym. According to the 2017 Kaufman Index of Startup Activity, there are 540,000 new startups being formed every month in the United States. That means there’s a lot of competition for picking a new brand name. Using the strategies and tactics discussed so will serve as your foundation. Due to the increased competition for common words, companies have resorted to inventing new words, intentional misspellings, and creative usage of the top level domain term (TLD). The invention of words and intentional misspellings are nothing new. We’ve seen them since the web 2.0 days of Flickr, Tumblr, and so on. The only that’s changed is that they are becoming increasingly common due the increased competition. If you decide to use a name like this you should still try to future-proof your name as much as possible and make sure it is easy to remember and easy to understand. You don’t want to throw the baby out with the bath water! The other big trend we’re seeing more of these days is the use of creative domain extensions. More and more technology companies are using them to set themselves apart as cutting edge and forward thinking. One of the earliest examples is delicio.us using .us instead of .com. Another domain extension, .io, which was originally intended for the British Indian Ocean territory is being used as a substitute for “input-output” by SaaS companies like close.io and seats.io since their tech forward audiences intuitively understand it. Beware though, all trends can be overdone and may have limited mileage. At the end of the day, 57.6% of the domains registered in the United States are a .com. With this type of market saturation, a .com is always a sure bet to making sure people remember what to type into the browser when they think of your company name.